1 photograph : b&w ; 19 x 22 in. 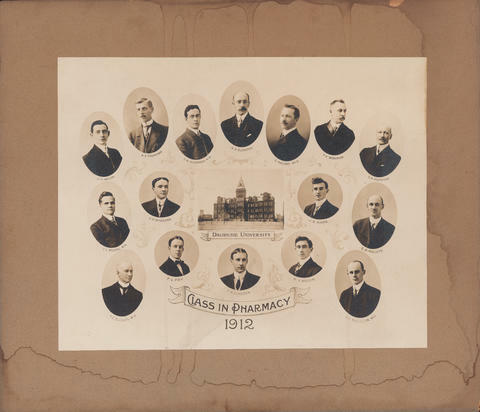 Item is a composite photograph of the Dalhousie University pharmacy class of 1912. The photograph consists of portraits of A. E. Buckley; F. L. Fry; J. P. McKenna; C. L. Moore; J. D. Walsh; A. A. Thompson; C. B. Nickerson; G. A. Burbidge; E. MacKay; F. R. Clayden; H. A. Watson; E. K. Maclellan; E. M. MacLeod; C. A. Mumford; J. B. Adams; and T. V. Woolwich arranged on an illustrated background around a photograph of the Forrest Building.